NOTE: Date must be in the form YYYY-MM-DD, like 2019-02-06. 2019-02-06 - City Hall, 116 Campbellsville Street, Columbia, KY - Photo by Linda Waggener, ColumbiaMagazine.com. 911 Director Jason Upchurch, left, was at the City Council meeting Monday, February 4, 2019, to ask for a police cruiser that is surplus for the City which would be helpful to his department. The vote was unanimous to grant his request pending acceptance by the Fiscal Court. 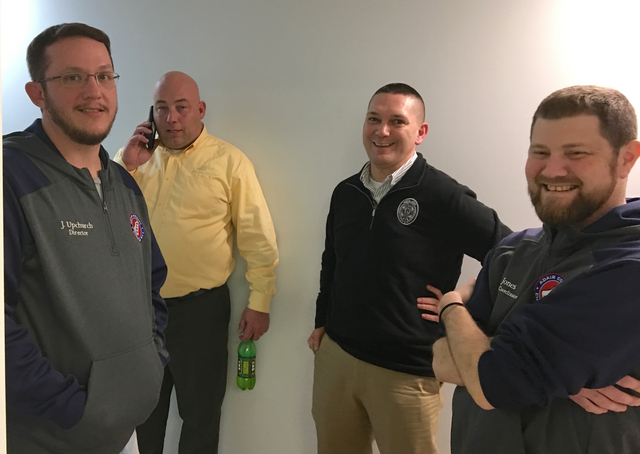 With him, to his left are Donald Hare,Public Information Officer, Adair County Fire Department; CPD Chief Jason Cross; and Kevin Jones, Adair Mapping and Addressing Coordinator. Columbia/Adair Utilities District will have a Special Regular Board Meeting on Wednesday, February 13, 2019. The Special meeting is due to a change in the date for the February Board meeting. ACLL Baseball signup opportunities will be every Monday and Wednesday in February. Volunteers will be available on Mondays from 5pmCT to 8pmCT, and on Wednesdays from 6pmCT until 8pmCT, in the Blue Building at the Joe Johnson Ballpark, 167 Doc Walker Rd, Columbia, KY. The uniform vendor will be on site for sizing, so bring your children who will be playing to the signup session. Call or text 270-378-1343 for more information. Casey County, KY - Sergeant Adam Likins is investigating a collision that occurred on Tuesday, February 5th, 2019 at approximately 12:50pmET, on KY 49, six miles north of Liberty. Preliminary investigations indicate that Peggy Long, age 58, of Liberty, was operating a 2000 Nissan Maxima, southbound on KY 49 when she lost control of her vehicle, dropped off the right side of the roadway, struck an earth embankment, and overturned. Long and passenger, Amy Mina, age 38, of Liberty, were both wearing seatbelts and were transported to Casey County Hospital by Casey County EMS where they were treated for non-life threatening injuries. Gloria was a talented musician, an officer of the ladies auxiliary of the VFW and a server at the Village Restaurant. Gloria Jean Hitch, of Liberty, passed away on February 5, 2019, at the Ephraim McDowell Regional Medical Center. Gloria was 73 years of age. A graveside service will be held at 2pmET on Friday, February 8, 2019, at the Salem Cemetery, Salem United Methodist Church, 3085 Linnie Rheber Rd., Liberty, KY, with Bro. John Edgell officiating. Lindsey Wilson football coach Chris Oliver announced the 2019 Blue Raider signing class this afternoon, including Dontavis Oates of Glasgow, KY, and Bryce Howard of Monticello, KY.
"Recruiting young men who fit into our program on and off the field is such an important part of our success," Oliver said. "During the recruiting process we are very clear about what we expect of the young men within our program. So when someone makes the decision to become a Blue Raider, we feel confident about their enthusiasm for being a part of our culture. Frankfort, KY - Gov. Matt Bevin's legal team last week filed their brief in the ongoing Louisville abortion clinic transfer agreement case currently before the U.S. Court of Appeals for the Sixth Circuit. At issue is the constitutionality of a 1998 state law requiring abortion clinics to maintain transfer agreements with local acute care hospitals and transportation agreements with ambulance services, as safeguards in the event of medical complications. The Bevin Administration is appealing a previous U.S. District Court ruling in favor of EMW Women's Surgical Center and Planned Parenthood of Indiana and Kentucky, Inc., which declared these safety measures to be an undue burden on the right to an abortion. Bowling Green, KY - Lawrence Madriaga of Campbellsville and Emma Moore of Liberty will be among twenty-two Western Kentucky University students who will present their research at the 2019 Posters-at-the-Capitol event on Thursday, February 21, 2019 in Frankfort, KY.
"At Western Kentucky University students have an opportunity to work alongside talented faculty in cutting-edge research, creative and scholarly endeavors," said Dr. Cheryl Davis, Associate Provost for Research and Creative Activity. "The Posters-at-the-Capitol event provides an opportunity for WKU students to meet their state legislators, present their work in person and explain the positive impact of their research experiences to those responsible for higher education funding in Kentucky." Frankfort, KY - The Kentucky Workforce Innovation Board (WIOB) and Department of Workforce Investment (DWI) are seeking public comments beginning Feb. 5 - 25, 2019 from consumers and workforce stakeholders on proposed changes to the Workforce Investment and Opportunity Act (WIOA) State Plan for the Commonwealth of Kentucky FY-2018. The fully-modified new plan is available online: KY_WIOA_StatePlanFY1819 (PDF). Public comment on the modifications should be submitted during the 20-day period beginning Feb. 5, 2019 and ending at 4pmET on Feb. 25, 2019. She was a homemaker, wife, mother and grandmother and friend to many. Errie Hughes Atchley, of Russell Springs, departed this life Wednesday, February 6, 2019 at her home. She was 89 years old. Funeral service for Errie Atchley will be held at 1pmCT on Saturday, February 9, 2019, at the Square Oak Separate Baptist Church, 3979 State Hwy 1611, Russell Springs, KY, with Bro. Bobby Conner and Bro. Troy Coffey officiating. Visitation is requested from 5pmCT until 8pmCT on Friday, February 8, 2019, at the Bernard Funeral Home Chapel, 367 N. Main St., Russell Springs, KY, and after 10amCT on Saturday at the church until funeral time at 1pmCT. Frankfort, KY - Farmers can earn extra money and support Kentucky's hunting heritage by participating in the Cooperative Dove Field Program offered by the Kentucky Department of Fish and Wildlife Resources. "Landowners may earn up to $10,000 in the Cooperative Dove Field Program," said Kentucky Fish and Wildlife migratory bird biologist Wes Little. "They earn $300 per acre planted." The FROZEN Tea Party/Play-Along is two Saturdays this year - Feb 9th and 16, 2019, at 10amET at Kentucky Classic Arts at Centre Square, 237 N Spalding Ave, Lebanon, KY. Sit down for brunch and high tea, enjoy an interactive show, play games, take photos and sing with Elsa, Anna, and friends! The event is $25 per person, and children under 10 yrs must attend with a ticketed adult. Seats be reserved at kyclassicarts.com or by calling 270-699-ARTS. love's random blooms reflecting in love's eye? Frankfort, KY - Gov. Matt Bevin will deliver his 2019 State of the Commonwealth to members of the General Assembly and fellow Kentuckians from the State Capitol Building in Frankfort on Thursday evening, February 7, 2019, at 6pmCT/7pmET. The address will be live-streamed on Gov. Bevin's official Facebook page and on KET at the following special link: ket.org/legislature. Georgia and her late husband were the founders of the Brush Creek Pentecostal Church. Georgia loved the Lord and enjoyed being a pastor's wife. Georgia Sandusky Scott, of Liberty, passed away on Tuesday, February 5, 2019, at the UK Hospital in Lexington, KY. She was 73 years old. Funeral services are at 1pmET on Friday, February 8, 2019, at Brush Creek Pentecostal Church, 2411 KY-49, Liberty, KY, with Bro. Ron Robinson, Josh Robinson, Sarah Tackett, and Becky Scott officiating. Burial will follow in the Whited Cemetery. Visitation will be held from 5pmET until 9pmET on Thursday, February 7, 2019, at McKinney-Brown Funeral Home, 752 Campbellsville St, Liberty, KY, and from 10amET until time of services on Friday at Brush Creek Pentecostal Church. The case of a missing and presumed murdered Bardstown woman will reach a national audience once again this afternoon. Sherry Ballard, the mother of Crystal Rogers, is part of the lineup on the Wednesday afternoon broadcast of "The Dr. Phil Show." A large group gathered at the Adair Public Library Monday evening, February 4, 2019, to learn more about a fascinating topic: the Melungeon people, and the DNA studies on this amalgamation of the Southern American population. Darlene Franklin Campbell, who has spoken to us on this topic in the past, offered an exciting, revised presentation, adding fresh insight and new DNA results, bringing to life the ancient Melungeons, and more strongly connecting the present generations. A Papa John's delivery driver received an unexpected surprise Sunday when he showed up in the middle of a sermon at Nelson Christian Church with a pizza order. About 30 minutes prior, Pastor Mark Jones caused a few chuckles and perplexed looks from the congregation during the 10:40 a.m. service when he whipped out his cell phone on stage to make a call. "I need to order a pizza please," Jones told the order taker. "I would like to have an extra-large pepperoni pizza and an order of breadsticks." While the pizza was a snack for the leadership meeting after church, the purpose of the mid-service delivery was to help Jones illustrate his final sermon on generosity. When employee Stephen Greenwell walked through the door with the order, Jones brought the man up on stage, shook his hand and gave him a small pink box that contained the money collected throughout the morning -- $717. At Monday Night's February 2019 City Council meeting, in addition to the agenda items of Farmers Market and annual audit, Mayor Pam Hoots handed out information about priority items worked on during the month of January. Several were in attendance from the Farmers Market asking for assurance they can continue to be located on the corner of Merchant and Campbellsville Streets. The Council asked City Attorney Helm to write a new, updated agreement, and asked the FM2 representatives to bring updated insurance plans for his study. After that is done, a special called meeting will be held for a final vote with expectations that the Market will open in their same place the first of April. The annual audit has been completed and was presented at the Council meeting. Mayor Hoots called it, "an excellent review." The Mayor's list, handed out at the February 4, 2019 meeting, follows. Ms. Welch was the former manager at Colorama in Campbellsville until her health forced her into early retirement. She cherished her family time, and loved working puzzles or simply watching Netflix with them. Ms. Dana Cox Welch of Campbellsville passed from this life on Monday, February 4, 2019 at the Taylor Regional Hospital after an extended illness. She was 44 years old. There will be a funeral service to honor the life of Ms. Welch on Friday, February 8, 2019 at 2pmET in the chapel of the L.R. Petty Funeral Home, 1765 New Columbia Rd., Campbellsville, KY. Travis Bright will be officiating. Ms. Welch's request to be cremated will be honored after the service. The family will receive friends at the funeral home on Friday, Feb 8, from 11amET until time for the service. When Mr. T.F. "Tim" Collins died in the late spring of 1917, his will contained simple provisions, to-wit: modest cash amounts to his and Mrs. Collins' several children and $50 to another family member. The balance of his estate, including the residence, went to his wife, the former Miss Elizabeth Aaron, and upon her passing, the estate residue was to be equally divided among their children. Mrs. Collins died almost exactly six years later, in June 1923. Come December that year, notice of a Master Commissioner's sale began appearing in the News, the last such in the January 1, 1924 edition. The No. 8-ranked Lindsey Wilson wrestling team fell to No. 5 Cumberlands (Ky.) 26-14 on senior night at Biggers Sports Center. Lindsey Wilson (5-2 MSC) fell in the first two matches of the night to spot Cumberlands (7-0 MSC) an early 9-0 advantage. Trent Johnson (No. 6 at 141) was able to battle his way to an 8-2 lead over Chasen Brown entering the final period as he managed to take the bout via an 11-5 decision. It's currently 62F at the Adair County Mesonet station. The National Weather Service is calling for periods of showers and possibly a thunderstorm today. Some of the storms could produce heavy rain. Today's high will be near 70F, with southwest wind 7 to 14 mph, and gusts as high as 25 mph. The chance of precipitation is 100%. New rainfall amounts between three quarters and one inch are possible. The overnight low will be around 60F, with continued chance of showers and thunderstorms, and a south wind 7 to 9 mph. The overnight chance of precipitation is 100%. New rainfall amounts between three quarters and one inch are possible. Thursday will bring even more showers and possibly a thunderstorm. Thursday's high is expected to be near 72F, with south wind 10 to 20 mph, gusting as high as 36 mph. The chance of precipitation is 80% on Thursday, with new rainfall amounts between a quarter and half of an inch possible. to set their own schemes. --Robert Stone, Wednesday, 6 February 2019. Adair County: No events Circuit Court. 64 events District Court. Casey County: 1 event Circuit Court. No events District Court. Cumberland County: No events Circuit Court. 93 events District Court. Green County: 107 events Circuit Court. 2 events District Court. Metcalfe County: No events Circuit Court. 53 events District Court. Russell County: 4 events Circuit Court. 1 event District Court. Taylor County: No events Circuit Court. 139 events District Court.